This is a new, long review of an old but very fascinating game! Developed by Magnavox and published by Magnavox in the US and their parent company Phillips in EU. Originally Posted by The inside front cover of the manual, because Magnavox writing is great stuff! You are about to become a legend in your own time and enter an alternate world where dreams (and nightmares) come true with fire-breathing reality.Special microcomputer circuitry will generate the alternate time frequencies and dimension warps necessary for finite control and monitoring of your alter-presence via television — while you remain physically secure in the relative safety of your home dimension. I don’t think I could ever write something that great. The Quest for the Rings is a hybrid board and video game from Magnavox that was released in 1981. The game is a co-op fantasy action/adventure/stealth game, and for 1981 this is an incredibly interesting and unique game. Following Atari’s game Adventure for the Atari 2600 in 1979, Quest for the Rings is one of the first ever fantasy games on a home console. Fantasy games were already gaining popularity on computers, with titles like Zork, Adventure (Collosal Cave), Akalabeth, and Wizardry, but on consoles fantasy games took a little longer to get established. This is one of the games that helped bring fantasy gaming to home consoles. It’s also one of the first ever co-op multiplayer games I know of that isn’t a Pong clone, a pretty important thing! Quest for the Rings is a flawed game, and there are a few things I really dislike about it, but there are also some great elements to the game as well, and either way, it is a quite unique title well worth a look. Quest for the Rings is a fantasy action/adventure game, and your goal is to get the ring on each screen. This might sound like an early RPG or hack-and-slash games, but it is designed to be more of a stealth game, from long before that genre even existed. You CANNOT kill any monsters in this game. Yes, you can die very easily, one hit knocks you out until the next screen in fact, but the monsters are invincible. Some characters can stun or warp around the monsters, but no foes can be permanently killed, unless you get to the ring and win the level of course. Yes, really. It’s one of the most bizarre design decisions in the game, and I really disliked it at first, though you get used to it with time. Quest for the Rings comes in a large box. The game comes with a cartridge with gold label; a plastic tray with two compartments, the first of which holds the cart and the second which holds a lid that covers a space for the metal tokens and plastic covers; an overlay that goes over the O2’s keyboard (on the system), to make the buttons you press during play (to set up dungeons, in the main game mode) look cooler; a thick manual; and a game board, which folds out into a decent-sized board. The manual cover. The dragon image is inset, on a second page glued to this first one. Image source: O2 Homepage article linked at the end of this review. Quest for the Rings looks like it was inspired by Tolkein’s Lord of the Rings, Dungeons & Dragons, Adventure (with perhaps a dash of Pac-Man), and a basic board game. It is both very familiar in theme, yet unique. The packaging has a great ’70s or early ’80s look to it, and it’s definitely a positive for the game. This game has high production values in its packaging. The actual video game element is, of course, extremely simple looking as all O2 games are, but they did their best to impress outside of the videogame, and it works. I like the art in the manual and on the game board. The art is a product of its time, for sure, and it looks good. They clearly put a lot of work into designing the look of this game! Comparing that art to the ingame graphics, which are also pictured in the manual, is amusing. The game has a substantial amount of text in its thick manual as well. The writers did a great job, particularly with the names! In addition to the manual, every city and province on the map is named. 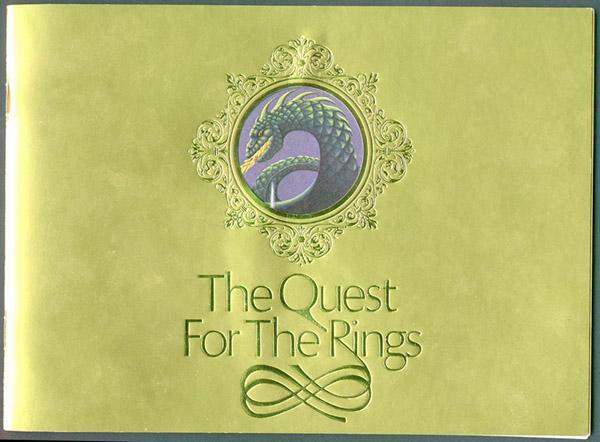 Of course, since this is a fantasy game about collecting rings, it brings Tolkein to mind. While the concept is obviously inspired by Lord of the Rings, it’s not just a copy of that story. The villain is the Ringmaster, a being who is the essence of the great Ring, which fell into a volcano. The Ring slept for a long time, and its Ring-spawn dreamed of the ten scattered lesser Rings. Now the Ringmaster is awakening, and the Ring-spawn’s dreams now summon nightmares. The nightmare hordes are gathering the rings, waiting to give them to their master once he fully awakes. I won’t copy the text of the Prologue page; get the game and read it! It’s a solid fantasy backstory. Four heroes have set off on a quest to stop the Ringmaster by taking the ten lesser rings which are giving him power. Two players play as the heroes, and one as the Ringmaster, playing as game master. If the heroes gather the rings together before time runs out, they can destroy him with their power. You win the game by collecting all ten rings. This is a second-gen game, don’t expect a final boss. This is the one flaw with the story; why does collecting all ten lesser rings automatically defeat the Ringmaster? This isn’t explained, unfortunately. There are two ways to play Quest for the Rings. First, you can play the full adventure, using the board and pieces. This is designed for three players, but can be played with two with some limitations. Press “Ringmaster” on the overlay (Space button) to start this mode. Alternately, you can just Start the game and play a simple arcade-style mode with an endless-until-you-win sequence of dungeons. Press Start (numeral 0 key) to play this mode. This is the best mode for a single player game, so it’s what I’ve played the most. It’s actually two player only, but it’s very playable with only one person — just have both controllers near you, and choose which one you want to use on each stage based on the stage layout. It’s harder than with two people, but really does work great. Plenty fun. In either mode, you win when you get a total of ten rings between the two characters combined. You can’t lose in the game; for that, you have to stick to the suggested turn limits in the manual. So yes, in the arcade mode, there’s no way to lose unless you keep track of how many times you’ve died and stop playing after the suggested 100 (Easy), 75 (Medium), or 50 (Hard) turn limits. Again, limited compared to newer games, but this game IS a console game from 1981, and that board needs to be used for something; it has the turn counter going around the outside. I have mostly played the game in the arcade mode, because I only got the game fairly recently and don’t often have opportunities to play local multiplayer games, but I really wanted to cover the game as best I can anyway; this is a really interesting game, and I kind of like it… and kind of dislike it. The game has some definite issues, but also strengths. In one or two player arcade mode (pressed Start instead of Ringmaster), a game of Quest for the Rings probably will take somewhere between 15 and 30 minutes, give or take. With only one player you’ll be on the upper end of that scale for sure, or longer. That may sound short, but for a second generation game which has an ending, it’s actually really long! Atari 2600 action-adventure games like Adventure, Haunted House, Raiders of the Lost Ark, and and E.T. can be beaten in five minutes or less if you know what you’re doing. Those games are interesting, but painfully short experiences for anyone used to third-gen gaming or beyond. Quest for the Rings, however, feels like a much more full-fledged experience. I wish it had a final boss fight, but otherwise, this is good just as it is. Also, in board game mode, playtime likely doubles; it’ll take time to choose where to go, talk with the other players, etc. Back of the box. Note the dungeon artwork, character and enemy art, and fully set up game board and system with overlay. In the main game, the basic concept is that the heroes are exploring the island as they try to find the ten rings, which are hidden around the map. 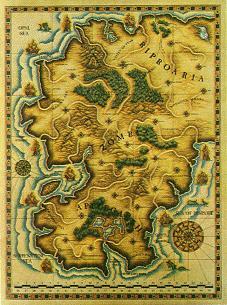 Players can start from any of the ports around the edges of the map. The map is a network of roads that you can move along that connect various spaces which represent the 23 castles and towns in the game. The Ringmaster, before play begins, places metal tokens that represent rings and stronger monsters underneath the 23 covers which represent the castles the heroes must assault. One metal token also represents the heroes. There are four for spaces with just a ring and normal enemies (Orcs and Firewraths), three for Dragons (with a ring), and three for Nightmares (two kinds of stronger monsters, which always are together, again with a ring). One cover goes over each space on the board. Covers have an image on the inside of them showing which level type you will face on that screen. So, the heroes don’t know which spaces have rings on them, and which have dragons or other monsters beyond the basic ones. They will just have to explore and figure out what’s been placed on each space. Once the heroes have been to a space, the cover on that space is removed. Players take the ring tile if they managed to actually get to it; this is not easy. Each level is a single screen. If any monster, or their attack, touches you, the hero ‘dies’ and is sent back to the map, but the survivor can keep trying to reach the ring. If the heroes get the ring, take the metal token; otherwise, leave it. The Ringmaster can move dragons which have been revealed around the map. If you get the Dragon’s ring you take the token, but until then, they can be moved around. For some reason you can’t move the Nightmares, but I guess you could make up your own rule to allow that. That’s the game, essentially; it’s a fairly basic board game. Just move around the space, reveal what’s underneath them, and face that layout in the game. It reminds me a bit of Enchanted Forest, but with a videogame element and, honestly, less complexity in the board game than that fun childrens’ boardgame. Within the board game there are also a couple of optional rules or modes they suggest in the manual, including whether to use the game master’s ‘Possession’ mechanic (explained later), a way to play the board game with only two players (one player sets the game up, the other makes all movement choices; no possession of course), and the turn limit players agree to limit themselves to. There are no difficulty level options, but the game is plenty challenging enough as it is, apart from there being no way to lose other than running out of turns of course. As far as the cartridge itself is concerned you won’t lose unless you choose to stop, but once you get all ten rings, the game ends immediately, with an O2-standard hard stop; you’ll need to hit power or reset to play again. Now, in just about any game from the third gen on (mid ’80s to the present), this would mean that you win the game by fighting the demon lord. This is a second-gen game, though, so as I said earlier, adjust your expectations down; the game ends the instant you collect the tenth ring. That’s disappointing, but expected for a console game of its age. The two players do most of the playing; the game master doesn’t do all that much once the game is set up, unfortunately. If you play with Possession, though, the game master can play once in a while. The game master can also move certain enemies around, if they have been revealed. Of course, this isn’t just a board game, it is also a video game, and a decent one. You’ll spend a fair amount of time in the game. The game has average O2 graphics, which I describe below in their applicable categories, and okay sound. The sound effects are basic and standard for the system, but the game does have some nice droning background audio. It does a good job of enhancing the creepy atmosphere of the game. It’s too bad that this game didn’t release a year later and get The Voice support, for some speech; that’d have been cool. Ah well. First I will discuss the levels, then the stealthy nature of the gameplay, then the characters, the monsters, and last the optional Possession rule. When you start a game, first you select your characters. In arcade mode, you immediately then go to the dungeons; in the main game, it’ll now wait until the Ringmaster punches in a setup. Once this is done, you go to the dungeons with a nice effect! The square ‘rings’ around the character select box start blinking, to create an effect that looks like you’re warping through space. The manual says that actually you’re going through the Ringmaster’s red fog as you travel towards your destination. Sure. You’ll see this screen after each level you complete. I like this effect; O2 games rarely have any kind of screens in between levels. Of course, the game ends when you hit the turn limit on the board or get ten rings. Each level is a single screen map, made up of large O2 background-graphics squares in a random pattern. Yes, floor layouts are randomized. Some will be open and easy to move around, while others will have a maze of walls to navigate around that make the enemies’ task of stopping you much easier. Basic enemies are scattered around the screen at the start. Your heroes start near the middle, and the ring is somewhere along the bottom edge. Movement is slow, and the enemies dangerous, so getting to the ring can be a difficult task. It’d be nice if the mazes were more detailed, but one of the many limitations of the O2 is that it can only put squares or lines along a 9×8 grid; you cannot directly draw an environment onto the screen in any design you wish, unlike pretty much any other console. Still, it works; the mazes are as complex as a game where the walls are large squares on a 9×8 grid can be. Only two squares, in the upper left and upper right, are reserved for the interface — this number show how many rings each player has. Ten total wins, but it’s nice to see who has gotten more. The game takes up the rest of the screen. Many O2 games have a full bar for the interface, so I like the increased screen area the reduced interface gets. Also, you can freely move around the screen (albeit slowly), unlike the tile-based movement in, say, KC Munchkin (O2). The game has four kinds of stage environments. The art in the manual for each one of the four is fantastic, maybe the best in the game. There’s nearly full-page artwork for each of the four settings! Small images of two of these are on the back of the box (pictured above). Dungeons – First, you have basic levels. Nothing special here. They have a set pattern and normal walls. These levels are often more open. In the main game, the Ringmaster gets seven Dungeons covers. Shifting Halls – Second, in these levels the maze randomly shifts during play. Essentially, every couple of seconds, the blocks move one space to the right, and a new row of random blocks is added on the left end. Don’t worry if a wall appears around you, it won’t hurt; you just won’t be able to move out of the block while in the wall unless you’re playing as the Phantom. These levels are fairly open. The Ringmaster gets six of these covers. Crystal Caverns – Third, there are levels with invisible walls. The walls appear if you touch one, but the rest of the time, they’re there… you just can’t see them, everything looks the same! The manual says that the caverns were built by the Windweilders with invisible walls, at the Ringmaster’s command. These can be tricky. The walls are normal, just invisible. These mazes have more walls on average than the above two. The Ringmaster gets six of these covers as well. Infernoes – And last, the Infernoes are levels with walls made of molten lava. The walls in these screens blink red and pink, so they’re easy to recognize. The merest touch on these walls will kill any of the heroes instantly, so be careful! These are the hardest levels by far, and have the fullest mazes. The Ringmaster only gets four Inferno covers, so use them wisely… or play the basic arcade game, and face who knows how many of them! Remember, in the arcade mode, levels will be randomized, but in the boardgame, the Ringmaster chooses the layout of stages. You might think that Dragons in Infernoes are the obvious biggest threat, but because of how dragons work, they work similarly in any stage. Nightmares in infernoes, though… those stages can be quite challenging. A Dungeon level, facing the Nightmares. What, what about the action? No, this isn’t really an action-heavy game, exactly. You can fight some enemies, but most of the time your main goal is avoiding them, getting around them, or sneaking past them. So, I’d like to discuss the “stealth” element of this game. Each hero has an entirely distinct role and plays VERY differently, so I will discuss the specifics how to play as each hero in the Characters section below. One can kill basic enemies at melee, one can stun or push back enemies, one can pass through most walls, and one can turn invisible. The best way to play this is as a co-op stealth game, I think. Think things through and take it slowly. You move quite slowly in this game, so that’s not too hard. However, I find it frustrating that I can’t actually hurt the enemies with three of the four characters! One hit kills any hero in this game, so even the basic foes are a significant threat for some of the heroes. So, I got used to this design decision, but I don’t really like it; I expect to be able to fight with any hero, including a “stealth” one. That’s how a modern game would work. But back in 1981, the idea that all players should of course be able to fight was a new one. They must have thought, why not make a game with so many limitations on its combat? Most of the players, fighting? That’d make the game too easy or something! Plus, this ways they’ll have to work together. But even so, it’s kind of frustrating game design. This is the kind of odd design decision that makes old games like this interesting; the designer(s) were trying new ideas and didn’t know what would work and what wouldn’t. This… kind of works. How fun players find the game will vary widely between players. There are three kinds of monsters: basic monsters, who can be killed; strong monsters, the Nightmares, who appear together and can be pushed back but are invincible; and Dragons, which are invincible and you should stay away from. All the invincible monsters, and the two heroes with distraction and invisibility or pass through walls powers, are why I called this game one of the first stealth games ever made, if not THE first. I guess that avoiding the ghosts in Pac-Man or the dragon in Adventure is kind of “stealthy”, but this game takes that to another level, in a way that I don’t think had been seen in console games before. I don’t have great patience for stealth games so I find this kind of annoying, but it is unique. The closest thing to this that I can think of to this, in terms of games with characters with strictly defined roles, is The Lost Vikings, but that game is a slow-paced puzzle-platformer game designed around single-player play, as you try to figure out the puzzle in each level using the three Vikings’ unique powers. I love the game in single player, but it’s not as good in co-op, honestly; I like being able to switch between all three Vikings. Anyway, that’s a very different kind of game from this. If you play Quest for the Rings you will quickly have to learn avoidance techniques for the enemies. Once I got used to the stealth focus of the game, though, I did begin to see the attraction to the design. Each screen is like a puzzle, and the ring is the goal. Can you get there, or will the enemies get you first? The Dragon (or is it Godzilla? ), in a Dungeon. You have four heroic adventurers to choose from, though only two can play at once because the O2 only has two controllers. The game starts with a character selection screen, and each player can select any of the four. It’d be fantastic if all four heroes could play at once, because they are each very different and have unique powers, but you can’t. You will just have to choose which two to take on each quest. This does add some nice replay value to the game, as playing the game as, and learning, each of the characters adds some fun challenge. I believe all four of them are male, as far as I can tell. Also, remember that each hero has only one hit point; any touch to a monster or dragonfire attack kills you instantly, until the next screen of course when you come back. All players use the standard Human character, but with slightly different colors or identifying marks to make them different. Still, it can be easy to forget who you are, so pay attention. 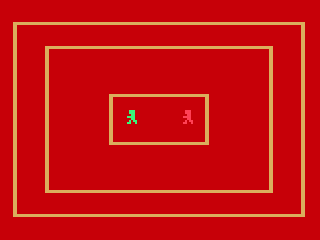 Whoever you choose to play as, player one is green and player two is red. The Warrior: The Warrior is the only hero who can actually get any monsters out of your way, so he is very useful. His sword is called Bloodeater, but for a sword with such a name, I sure wish that it could actually kill things! Ah well. Even so, the Warrior makes the game more straightforward when chosen because of his combat abilities. Without him this game becomes even more of an avoidance-centric game than it already is. When you press the button while facing left or right — and ONLY left or right, a significant limitation, you swing your sword. The sword will warp the other hero, Orcs, and Firewraths to the right side of the screen, getting them out of your way. Yes, you can hit the other player with it, so watch out. The sword can also push back both kinds of Nightmares and even turn away the Dragon, though sometimes I couldn’t get them to actually move backwards, just stop. They can be stubborn, but at least you can do something to slow them down. If you hit a Nightmare and it is stunned, it still will kill a hero if you touch it, so stay away! Also stay far away from dragons. Getting close enough to actually hit the dragon and turn it away is far more dangerous than it’s worth, and iwll probably lead to your death. The Wizard: The Wizard is the other hero with an attack. He can fire a magic bolt, again either left or right only, which can push back stronger monsters, and will stun weaker ones for a few seconds. Yes, this mighty wizard can at best only stun his foes. Why couldn’t they have found someone who knew Fireball? The game would be more fun that way! Ah well. The wizard is very useful because it gives you a ranged attack, which is very useful at times against the spiders and gargoyles, but the lack of ability to hurt anything is annoying. I know that since the warrior has only a short-ranged attack a long-range attack would be quite unbalanced, but having only ONE character who can kill anything is too limiting. The Changeling: The Changeling’s power is the Mirrorcloak of Invisibility. If you press the button, the Shadow turns invisible. This sounds great, but he is actually the hardest hero to get used to, because when invisible you are, well, invisible. You’ll have to try to remember where you are. Also, while invisible you move at only half speed! Yeah, the Shadow is a real challenge to play as. Still, he can be great against Dragons, because as slow as he is, it will often be possible to get past that dragon while invisible, something difficult to do otherwise. He cannot attack, so all the Shadow can do is avoid enemies and try to sneak to the ring. If an enemy touches you while you’re invisible, you die. It’s harsh, but that’s how the game provides a challenge. So yeah, you need to pay CLOSE attention to stay alive as this guy. The Phantom: The Phantom can walk through walls. Only stone walls, though! This guy is essentially a mage who knows Pass Through Rock and nothing else. Hold the button down and you move at half speed and can walk through walls. This makes him near-useless in the Infernal Caverns, since he will die if he touches the walls. The Phantom does have one essential power in any kind of level, though: While using your power, enemies move towards the Phantom. This means that the basic strategy in this game, if a player is using the Phantom, is to get enemies to move way from the Ring with the Phantom, then go in with the other player to grab the ring. The game does keep track of how many rings each player has gotten on the screen, but all you need is all ten total in order to win. He also has no way to attack, of course, just like the Shadow. You must avoid the enemies which are coming to kill you. Fortunately, while you’re fully inside of a wall most enemies can’t get to you, so you can hide out, even if going out of the wall is likely suicide due to how slowly you move. An ideal party is probably the Warrior or Wizard and Phantom or Changeling, to have one fighter-type and one ability-type. Of course, the Warrior and Wizard is also viable. Phantom and Changeling makes the game a pure avoidance game; this is the most challenging combination to use, for more experienced players. Facing the Nightmares in an Infernoes stage. Image source: Mobygames. Orcs use the standard Human character that the players do, but with a different color. They are basic enemies and are warped away by the Warrior’s sword, and get stunned by the Wizard’s magic. Firewraths are basically red Orcs. Supposedly they move slightly faster than Orcs, but otherwise they’re exactly the same except for color, and are the “other” type of basic enemy. If they touch you you will vanish (die). Spydroth Tyrantulus are giant spiders with an awesome scary name. They’ve got a custom sprite. These are Nightmares, and will appear only on screens or spaces with a Nightmares tile. Both kinds of Nightmares always appear together. These ones can be very difficult to get past when one blocks a passage you must get through — while Warrior and Wizard attacks can potentially push them back, it doesn’t always work, particularly if only one player has an attack. You can stop them from moving forward, but actually pushing them back can be futile. Remember, you can’t kill them. Some hits will knock them out for a moment, though, so you can at least hurt them and stop their advance. If one touches you, it EATS YOU ALIVE! Yes, your little guy gets slowly consumed by the spider. It’s creepy stuff for such an old game! The Doomwinged Bloodthirsts, a sort of pterodactyl or gargoyle or such, is the other Nightmare. These monsters can fly through the walls, so beware. Otherwise they’re similar to the spiders. These guys have the coolest name! Seriously, Magnavox’s writers did a great job here. They didn’t need to put this much into the writing, but it’s great that they did. They also have a great custom sprite, and eat you if they touch you. Argh. Dragons are the strongest monsters. They also have a custom sprite, though they sort of look more like Godzilla than they do dragons. These guys are a serious threat, and you WILL die, and often, against these invincible monsters. You can try to attack dragons, and can get them to turn around if you hit one in the head, but it’s probably a doomed effort, because Dragons can breathe fire, and if the fire touches you, you die. Warrior and Wizard attacks can stop dragonfire, maybe, but if you chance it, you’re sure to fail before long. If you move in a horizontal line with the dragon, it will attack. Of course, Dragons always are between you and the ring, so you’ll have to find a way to get around or sneak past them in order to get to the ring. It can be tricky, but it’s rewarding when you finally succeed. The writers even named each of the dragons in the manual, which is a cool touch when ingame they’re identical. The three dragons are Goldfang, Scortha, and Mythrog. This is for the board game variant only. If you play with the suggested three-player game, after finishing setting up the game, other than moving around revealed dragons, there is only one thing that the Ringmaster actually has to do during the entire time that the two players playing as the heroes are playing the game. That is Possession. The Ringmaster has eight Possession tokens, and each time they use Possession, they turn one of the tokens in. Possession allows the Ringmaster to take over the body of one of the heroes! Yes, this means that the villain player can take a controller from one of the two heroes eight times during the game. You can lure the enemies to the other hero, attack the other hero, and such. Of course, if the Ringmaster touches the ring by accident it counts for the heroes, since this is just a controller swap, so stay away from it. Naturally, game element this can play havoc with the players’ strategies… but Possession usages are limited, so use them carefully. Its great that the designers came up with SOMETHING for the Ringmaster to do during the game, because otherwise they’d be essentially useless. On that note, in the two player boardgame variant, there is no Possession of course, so maybe try playing with a lower number of maximum turns, since there will be no interference from your foe. The game board. Image source: O2 Homepage article linked at the end of this review. As I said, I haven’t played boardgame mode much, but I did play it enough to understand it, and the basic play is the same in either mode. Whether it’s in the random generator of arcade mode or human-designed situations in the board game, once you enter a stage, your hero, or heroes, are dropped in the center of the screen. Immediately identify who your character is! The manual warns you that Orcs and Firewraths look similar to your heroes, and they indeed do. Next, using your hero’s abilities, either try to see if you can get to the ring, or work with the other player, if you are playing in co-op. This game was designed around two players working together, so with only one player this is a tough game. Play it with a friend if you can! Even just the arcade mode, without the boardgame, is vastly superior with two people than it is with one. Is this the first co-op multiplayer console game ever, where two people work together to defeat computer-controlled opponents? I’m not sure if it is or not, but it certainly has to be one of the first. Finishing with no time limit is inevitable, but set a stricter time limit and Quest for the Rings is plenty hard! The monsters are dangerous, and death will happen quickly and often. Think, and work together. Co-op multiplayer games are great, and it works very well in this game. The very different powers of the four characters strongly encourage the players to work together. I wish you could play with all four at once, but ah well; the O2 only has two controller ports, nothing can be done about that on this system. And of course, most O2 games, including everything from Phillips-Magnavox except for Turtles, are O2-exclusive and never have any sequels on other platforms or any official re-releases anywhere else, so if you want to play Quest for the Rings, you need an O2. So, is the game worth getting? This is both a board game and a console game, so it’s got a fairly high barrier to entry; this isn’t an expensive game, and is the most common of the O2 boardgames, but still, it’s not something you see every day. But even so, honestly, yes, the game is worth it. Quest for the Rings is as frustrating as it is fun, and I don’t know if I’d actually call it a great game, but it’s unique, interesting, and compelling for a while at least. The game has a lot more variety than most second-gen games, for one. With a board to move around on, an optional human Ringmaster designing the layout of the board that the heroes will face and making things harder occasionally along the way during play, and more, the board game element adds some complexity, randomness, and fun. Videogame levels are much the same. There are three different types of walls to deal with, four different types of levels — just basic foes (board game mode only; you won’t see these stages in the arcade mode), basic baddies + ring, basic + nightmares, and basic + dragon — and four heroes, each with an entirely different and unique ability. The game is challenging, and trying to make my way to the ring on each screen, or even regularly, will require skill and strategy. This is NOT a fast-action game where you just run around and shoot things! It’s quite the opposite of that; this is a thinking-persons’ 1981 console game, which is quite a rare breed indeed. I like that element of the game more than I dislike it, despite my complaints above. There is more to this game than many games of its generation. I know I’ve said this repeatedly, but it’s a unique and interesting game, and broke new and unseen ground for a console game at the time of its release in 1981. Quest for the Rings is a one player or two player co-op (versus optional human opponent of sorts) fantasy action/stealth board and video game. It’s like nothing else, and I’m happy to have it. I give the game a B, I guess. It’s hard to choose a score. This entry was posted in Articles, Classic Games, Full Reviews, Odyssey 2, Reviews and tagged action-adventure, co-op, fantasy, magnavox, odyssey 2, stealth, The Quest for the Rings. Bookmark the permalink. You have done an amazing write up of the game! Thank you so much for your time spent on putting this article together. There’s some really great information here and has me stoked for trying the game out again (if I can ever find where I put it). I first bought it when it came out (at a store called Best Products in Cherry Hill, NJ) and I remember feeling like I was holding a treasure because the box & contents were so awesome! I wish your article had been available back then… maybe I would have been able to deal with the frustration of constantly losing.